This Red brocade readymade angrakha style jacket is crafted with self weaving, sequins and patch patti work. Dark cream dupian silk dhoti comes along with this. This is also available in firoze colour. 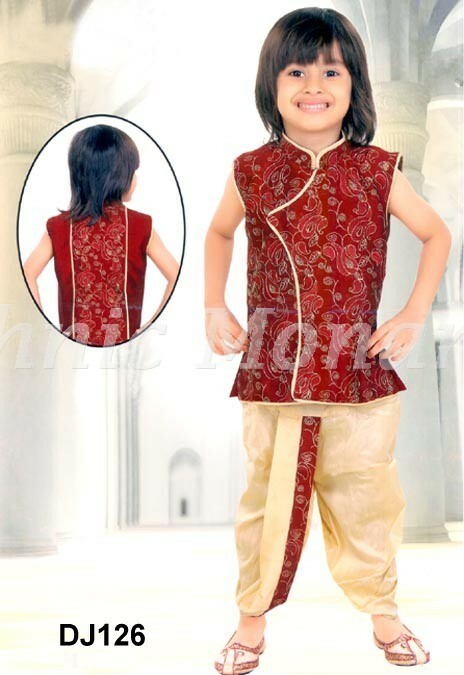 This Red brocade readymade angrakha style jacket is crafted with self weaving, sequins and patch patti work. Dark cream dupian silk dhoti comes along with this. Mojari shown in the image is just for photography purpose. Slight variation in colour and patch patti pattern is possible.This is also available in firoze colour.